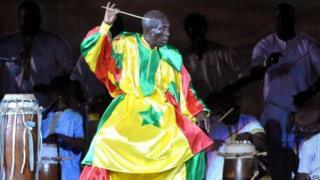 Renowned Senegalese drummer Doudou Ndiaye Rose has died aged 85, his family has announced. Famous for playing the sabar drum, he toured the world and played with jazz legends such as Dizzy Gillespie and Miles Davis, and the Rolling Stones. He led an orchestra of more than 30 drummers, many of them his children and grandchildren. The UN cultural agency declared him a "living human treasure" in 2006 for keeping alive traditional rhythms. Rose continued to play up until his death and a few years ago explained how happy he was to have spawned a dynasty of percussionists. "I thank the good lord. My children have learned the language of percussion well," he told the AFP news agency in 2010. "I can even no longer play and just listen to them." Senegalese rapper Didier Awadi, 46, said Rose was at ease playing with both modern acts and traditional groups. He was a genius, who was able to turn the sound of many drums into a symphony, he told the BBC's Newsday programme. "He can organise more than 100 drums and make the sound smooth." The rapper said every piece that Rose played had a message: "He knew the language of the drum, because the drum was our first cell phone to communicate." According to AFP, Rose was born into a griot family of musicians and story-tellers, but his accountant father did not want him to continue in the tradition. When the young man defied him, they went for seven years without shaking hands, it reports. Awadi said it was difficult to choose one track to sum up his mentor: "It is like Mozart or a great master, every piece is a 'chef d'oeuvre' (masterpiece)." What are your memories of Doudou Ndiaye Rose? Did you meet him? Let us know about your experiences. Email haveyoursay@bbc.co.uk with your stories.